Hey! 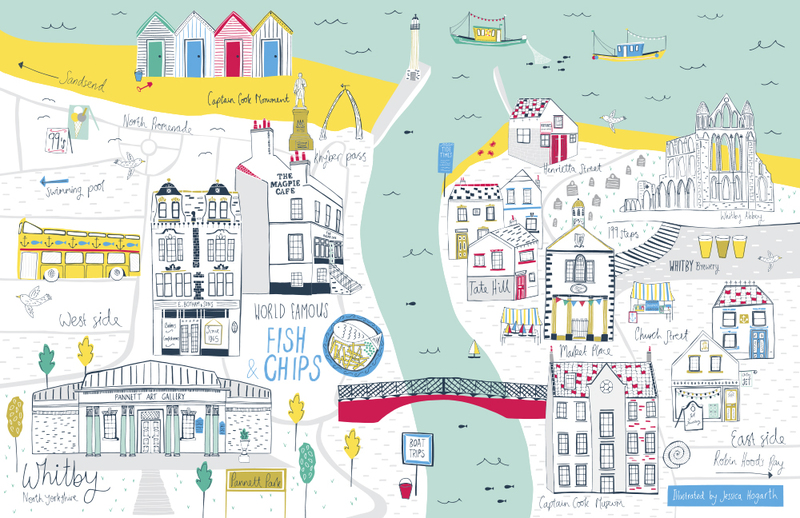 I’m Jessica Hogarth from Whitby, a picturesque fishing town on the North Yorkshire coast of England. I spend my days working from my studio on the east side of the town, and my free time socialising with friends and playing hockey! My coastal upbringing has had a big influence on my work and I love being so close to the sea. 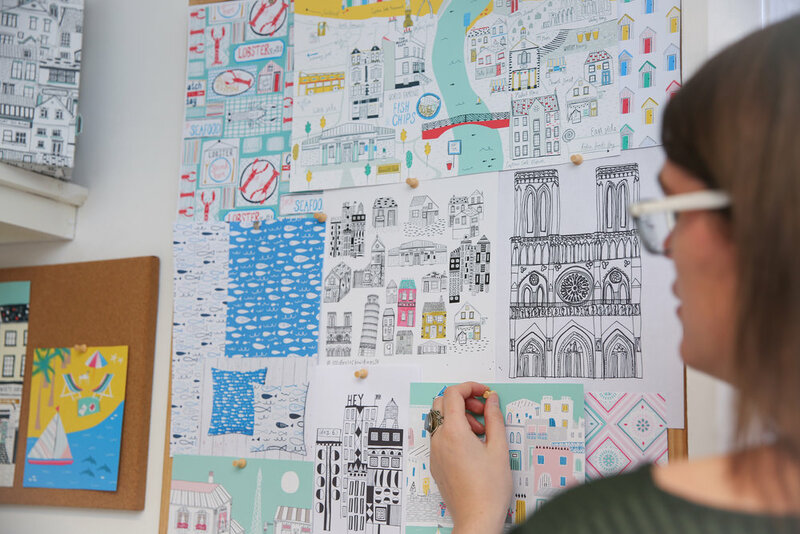 Since I began my degree in Printed Textiles and Surface Pattern Design I have been very passionate about illustration and surface pattern, but I wasn’t focused on art during my upbringing despite taking a fine art A level. I was sporty and musical, and after studying one semester of classical music I left to reassess my options and I discovered the surface pattern course. Looking back on my A level work, it was always quite pattern led, but since I didn’t really plan on following an artistic career I had no idea just how many different types of creative courses were out there until I started looking for them! My weeks are really varied, depending on deadlines and how many emails I have coming in. At some point you can guarantee I will be packing orders, doing some accounting, utilising social media and responding to emails. The odd week does go by where I don’t even pick up a pen to draw, but that is happening less and less which is good! Homesickness subsides eventually! It took me quite a while to settle in to university life but by the end of third year I didn’t want to leave! I definitely feel like I made the most of my time studying, but I wish I had worried less at the beginning. Taking a break is definitely necessary for me. I find it hard to work when surrounded by clutter, which is something I have only recently realised. I tidy up my work space when I am feeling in a rut, take a break from looking at my work and come back to it hopefully with a fresh pair of eyes later. Definitely paper and my 0.38 muji pens. Other than that, I sometimes use ink and brushes for creating little patterns, but the colouring of my artwork is done on Adobe Illustrator, so I definitely need a scanner, my computer and wacom tablet! My design process is fairly simple. All of my illustrations begin as black pen on paper before they are scanned in to the computer. I occasionally tidy them up in Photoshop, but all of the colouring is done in Illustrator. I also use this program to put illustrations in to repeat, or decide on the final layout for a piece of work. When I was at university I was a little more experimental, but this way of working has been successful for me, and it feels like the most natural way to create my art. Other than that my favourite app is Instagram. It’s addictive and I spend more time on there than I probably should! I was thrilled to work with the RNLI in 2014, when I created multiple fish illustrations and patterns for use across a variety of textile and stationery products. A different but really fun project was designing the art for a salad bowl used in a giveaway by Florette. My face went on to the packaging of salad bags in shops across the UK, and winners won a contemporary bowl, with the illustrations on it done by me! Repeat pattern is my passion, so it’s a pleasure to be collaborating with UK based company Deva Designs. I have created every day and Christmas art for them since 2014. 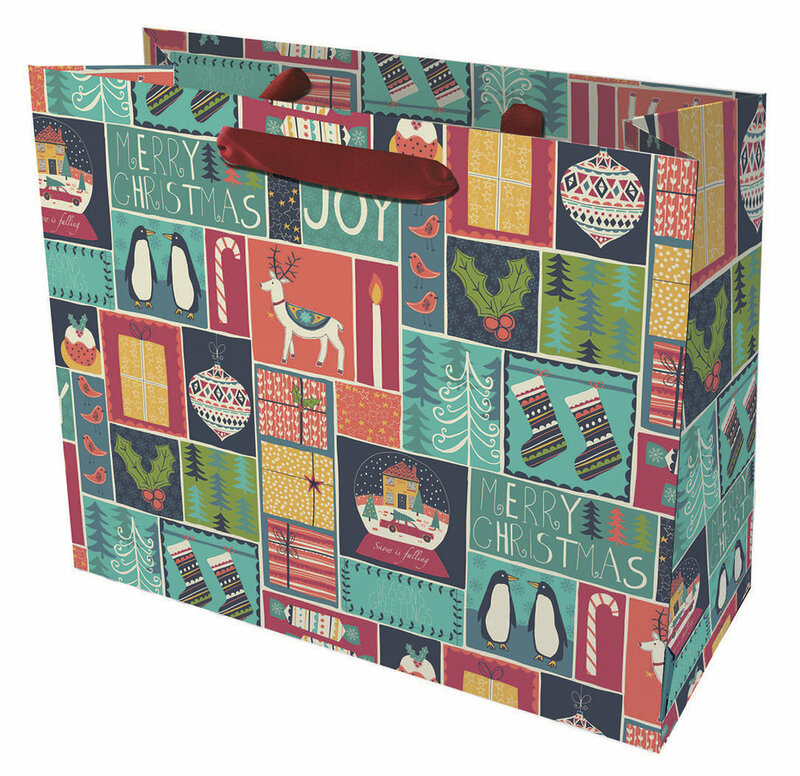 The designs are put on to gift wrap and bags and sold in independent outlets across the UK, as well as some high street stores including Waterstones and John Lewis. I worked with the Wall Street Journal a couple of years ago, and created an illustration for an article in their Mansion magazine. I would love to create more work for editorial. I’d also love to work with Anthropologie (who wouldn’t?!) 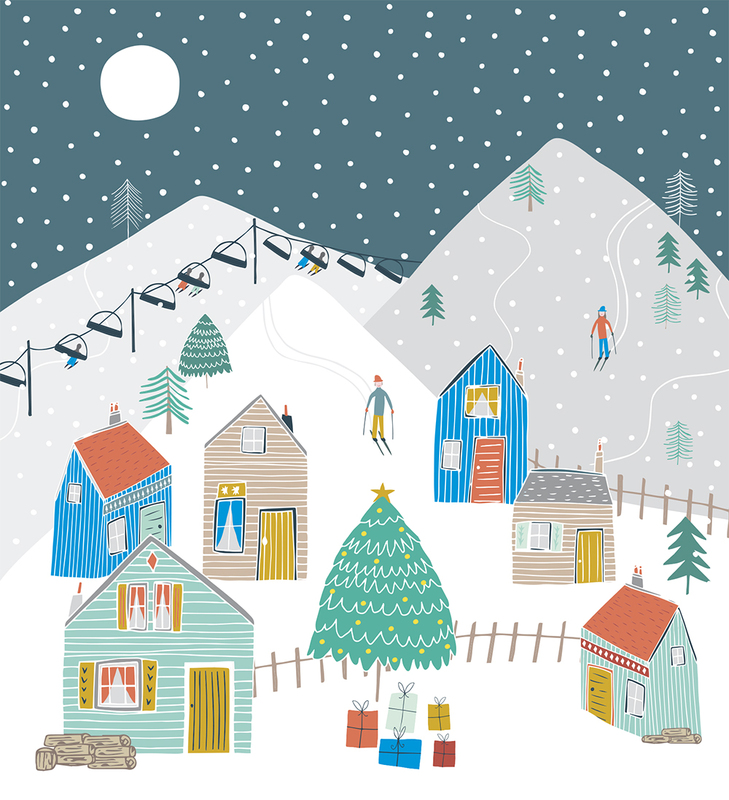 and Fishs Eddy, to create some quirky illustrations for their homewares. Loads of paper, pen and ink. Here, there are everywhere! I love getting out and about, and think being out of the four walls of my studio is good for getting creative ideas going. When I am in work I like to use Pinterest to look at visually exciting work, which always makes me feel inspired to get creative myself and push my own ideas. That is an impossible question to answer! I love everything that Anna Bond of Rifle Paper Co is about so I am going to say her if I must pick one, but really there are loads I could mention. I hope people remember me for being a happy and thoughtful person. Older PostPortfolio Sites: To Password Protect or Not?